Apologia: a reasoned defense of one's beliefs. 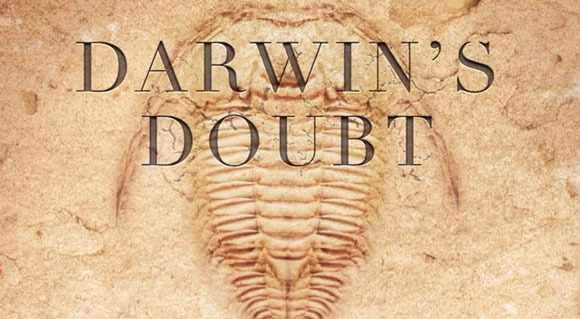 Stephen C. Meyer, Darwin’s Doubt: The Explosive Origin of Animal Life and the Case for Intelligent Design (New York, NY: HarperCollins, 2013). This is not an easy read. At 413 densely-worded pages, it took me the better part of a month to finish. However, I am glad that I persevered. This is a remarkably well-written, well-researched, and well-argued companion to Meyer’s previous volume Signature in the Cell. Whereas his earlier work made the case for intelligent design based on the complexity of the cell and the inadequacy of materialistic origin-of-life hypotheses, Darwin’s Doubt focuses on the origin of animal life, and the particular challenge posed by one feature of the geologic record: the so-called “Cambrian explosion.” The book is divided into three parts: Part 1 deals with the fossil evidence of the Cambrian explosion, Part 2 deals with the biological information necessary for animal life, and Part 3 argues that intelligent design provides a better explanation of all the evidence than any naturalistic alternatives. I will examine and evaluate each part in turn. Part 1 begins with a history of the early reception of On the Origin of Species by Charles Darwin. It is hard to overstate the significance of this little book, which became the foundation of modern evolutionary theory. The scope of Darwin’s theory was vast (after all, he was trying to explain all life as we know it! ), and he personally believed that he had solved every problem—save one. The budding discipline of modern geology had unearthed a piece of evidence that did not fit very well into Darwin’s gradualistic schema. Fossils indicate that about 530 million years ago—or what has come to be known as the Cambrian period—there was an extremely abrupt proliferation of different forms of animal life. These animal fossils showed no signs of evolutionary predecessors in earlier layers, leading to the apt description of the “Cambrian explosion.” Darwin himself was aware of this problem, and indeed it gave him some doubt as to the veracity of his theory (hence the title of Meyer’s book). However, he was confident that the problem would one day be solved—either it would be shown that Precambrian animals had not been fossilized for some reason, or their fossils had not yet been found. Meyer evaluates these two possibilities, and argues that subsequent history would have greatly disappointed Darwin. Both of these efforts at explaining away the Cambrian explosion are variants of the so-called “artifact hypothesis.” According to this hypothesis, Cambrian fossils are merely “artifacts” of an incomplete record. Some have suggested that paleontologists need only to look in other places around the globe to uncover Precambrian ancestors, while others have suggested reasons why such ancestors could not in principle have been preserved—perhaps, for example, their soft body forms did not lend themselves to fossilization. Unfortunately, neither solution appears to match the observed evidence. Paleontologists since the time of Darwin have examined geologic layers across the globe, with the conclusion that there are plenty of Precambrian layers, but zero evolutionary ancestors to Cambrian animals. Moreover, there are plenty of non-animal fossils in the Precambrian strata—even those with only soft body parts. But if these soft non-animal fossils could have been preserved, why not also their animal counterparts? Darwinian Theory does not provide an adequate explanation, nor have subsequent complementary theories to Darwinism (such as punctuated equilibrium). In Part 2, Meyer moves the discussion from fossils to genetics/anatomy. The fundamental challenge in building an animal from scratch is that you need to be able to create novel “protein folds.” This is one of the most basic units of mutational change that can lead to new function. And yet protein folds require a significant number of coordinated DNA mutations in order to come into being. Think of genes as letters strung together to form words, phrases, and sentences. If the genes are not precisely coordinated, the sentences will quickly degenerate into meaningless gibberish. This is the known as the problem of “combinatorial inflation.” Consider the example of a combination lock: each time you add another number to the lock, the resulting combination becomes exponentially more difficult to unlock. So it is with animal evolution—it becomes probabilistically prohibitive. In Part 3, having concluded that Darwinism isn’t up for the job, Meyer surveys some of the other naturalistic explanations on the market. But these are also shown to be inadequate for various reasons. It is only at this stage of Meyer’s argument that he finally puts forward his own theory: intelligent design. Animals bear all the marks of “specified complexity” that we find in the products of intelligent agents. We easily recognize design in the world of engineering, for example. Why should it not be so in the world of biology? In essence, Meyer is making his case as an inference to the best explanation—taking into account the entire range of data, and ruling out any hypotheses that lack sufficient explanatory power. Meyer is quick to point out that the theory of intelligent design is scientific and not necessarily religious in nature (although it would certainly have religious implications). And this brings me to my only possible critique of the book. Meyer’s reasons for wanting to distance intelligent design from religious creationism are political. His concern seems to be to allow the teaching of intelligent design in public schools. However, in my judgment the debate over public science education rests on the mistaken separation of “fact” from “value,” as if it were possible to teach religiously neutral science. This might be where my own neo-Calvinist sympathies come to the surface, but I believe that all education is inherently religious education. It all depends on what religion you subscribe to. And that means that fundamentally, all education will be either Christian or anti-Christian (although there will always be overlap, due to God’s common grace). So in the end, I don’t really have a problem saying that intelligent design is creationism. But that minor quibble aside, this is an outstanding book. It does get pretty technical pretty fast, so its audience will probably be limited to those with a college education. But this will be essential reading in debates over intelligent design in the coming years. I have not read the book in question, but I am up front that I am biased against ID. – positing testable, falsifiable, predictive hypotheses about natural phenomena? – testing these hypotheses in reproducible experiments using only measurable or observable evidence? – submitting the results of these experiments for peer review, patricularly by scientists not affiliated with or sympathetic to ID? ID may or may not be *true*, but without the above elements it is not *science*. That need not be taken as a moral judgement: the belief that Christ was resurrected three days after his crucifixion is not scientific, but needless to say Christians take it for truth (the Truth, indeed). With respect to the Cambrian Explosion, I am not qualified to comment, but these folks are: http://biologos.org/questions/cambrian-explosion. The “Further Reading” section presumably offers more in depth explanation. Beside ID’s pretensions to scientific credibility, its politically-motivated dishonesty about its sectarianism is also a mark against it. Just who is the Intelligent Designer? Would Meyer — or Philip Johnson, or Michael Behe, or any of their ideological confreres — be willing to concede that the identity of the Intelligent Designer could be Islam’s Allah, or the Hindu pantheon, or whatever it is which Sikhs, Shintos, or Jains worship? Of course not; their ID can only be God as described in Christianity, specifically evangelical Protestantism. Nothing wrong with that in and of itself (I am a Christian, after all), but be honest about it — unless of course you are trying to sneak your agenda into public education. I understand what you mean, but is “anti-Christian” appropriate? The Scriptures discussing general revelation (Psalm 19, Job 12, Romans 1, etc.) make it plain that anyone, irrespective of his worship or lack thereof in the one true God, can observe and study his creation, even if not fathoming the Creator’s true identity. Much of mathematics, for instance, is grounded in the discoveries of pagan Greeks centuries before the time of Christ (and likely unaware of the religious teachings of ancient Israelites), as well as some Muslims centuries later. Are these precepts — say, the Pythagorean theorum — necessarily anti-Christian, as opposed to neutrally applicable to believers and unbelievers alike? Noah, as always, thanks for your input. In response, I would concede that “science” may not be the best term to describe ID. Dr. Meyer’s reasoning seems to be based on a “process of elimination” logic. In that regard, I think that the neo-Darwinian synthesis (perhaps a more PC descriptor than “Darwinism”) is falsifiable–and, I would argue, falsified. So I think that Meyer succeeds in his negative claims, but his positive claim for ID as science is more tenuous. As for the Discovery Institute’s political goals, it’s probably going too far to call them “dishonest.” From all I’ve read, they seem to be sincere and candid in their agenda. And I think labeling them as “evangelical Protestants” is too narrow. Michael Behe, for example, is Roman Catholic, while Jonathan Wells is a Unificationist (not even in the Christian tradition). As for the question of “neutrality,” it is certainly true that unbelievers can grasp truth from general revelation. However, they will inevitably misinterpret the meaning of such truth, and so any non-Christian claims to knowledge will be ultimately be incoherent and inconsistent. I think that the idea of “neutral science” rests upon mistaken modernist notions of knowledge and objectivity. I will be sure to read the Biologos page on the Cambrian Explosion. Thanks for the link. Kyle, another book worth reading along similar lines is “What Darwin Got Wrong,” which asserts strongly that natural selection is false, and the authors are both committed atheists. Very technical, but worth at least checking out.